Minus the resolution of the device, everything else is top tier when it comes to specs. With physical QWERTY-sliders still popular to many people, I’m sure this device will be welcomed. Does this impending device appeal to any of you guys? I’m sure this news will sadden some folks as the RAZR HD has been an anticipated device from Motorola. Hopefully news of the RAZR HD’s release will leak out soon, and we’ll be sure to inform you as soon as we know. Recent rumors of the Sprint Galaxy Nexus release date certainly have many prospective and upgrade-ready Sprint customers stewing with anticipation. 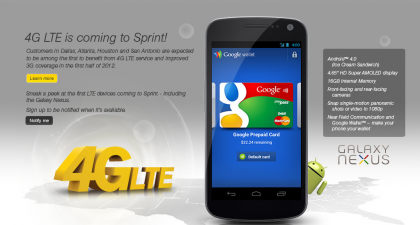 To appease the anxious and clamoring mob, Sprint has released a new video highlighting the hardware features of their soon to be released Galaxy Nexus along with suggested apps and a quick reminder of Sprint’s soon to be launched LTE network. It’s apparent that Sprint will be releasing this phone really soon, so let’s hope that really soon means the rumored April 22. Who among you are planning on picking up one of these bad boys? Apparently they didn’t want the video to be public so fast so they quickly removed. Sorry about that. 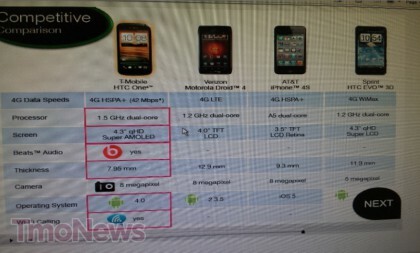 Lately, most of the blog sites have been referring to the DROID Incredible 4G as the HTC Incredible 4G sans DROID. We’ve been using the “DROID” name because my thoughts are that there isn’t much of a chance Verizon wouldn’t put this under the DROID line since the last 2 devices were. Of course nothing is official until we see it in a press release, but sometimes we can get a good idea of the naming scheme from accessory manufacturers. As you can see in the above image there is one minor addition and that’s LTE. I’m not sure Verizon really needs to add LTE to the name, but I think it’s safe to say it’s going to be a DROID folks. Let me first clue you in on a few of the specs of the LG Viper. This device may not be at the top of the food chain, but it’s not bad. Let’s start off by mentioning the OS, Android 2.3, which could quite possibly be upgraded to 4.0. The LG Viper sports a 4inch 480×800 screen, powered by a 1.2Ghz dual-core processor, 1GB RAM, LTE, 5MP rear-facing camera with a front-facing camera to compliment. 4GB built-in storage and a microSD card slot to expand on that storage. NFC and Google Wallet are also included with this Sprint device to round out a pretty robust Android phone for a mere $99 with a new 2yr contract. So for those of you with Sprint, and an upgrade burning a hole in your pocket, this device may be for you. Maybe you’re looking for a change from your current provider. If so this could be your chance to get your pre-order in on the first Sprint LTE phone at a great price. And with the rumor of a release date of April 22nd, you could be making calls, texting, surfing the web on your new LG Viper 4G LTE in just over a week! For those of you on Staten Island who are patiently waiting and secretly jealous of those areas around you (like Brooklyn, the Bronx, Manhattan and Queens) of having AT&T LTE service then you’re in luck as AT&T has flipped up the ON switch for you. You can now enjoy AT&T 4G LTE speeds in your area. And even more good news as folks in St. Louis can now enjoy the same service as well. This is apart of the 12 city push that AT&T announced back in March and is following the launch of the service in three areas on April 8th. So go out and enjoy your new break-neck speeds on your 4G device and if you haven’t purchased one yet maybe the rumor of the Galaxy Nexus on AT&T might entice you to consider one. Hit the break to read the official press release. And for those folk left on the list of cities who are patiently waiting for this service don’t worry I’m sure you’ll get some LTE goodness sometime in the near future. Enjoy! NEW YORK, April 11, 2012 /PRNewswire/ — AT&T* has expanded its 4G LTE network in Staten Island, bringing more customers the latest generation of wireless network technology. The expanded coverage is part of its ongoing rollout across the market. AT&T 4G LTE coverage now includes all five boroughs. Cool new devices. AT&T offers several LTE-compatible devices, including new AT&T 4G LTE smartphones and tablets, such as the first LTE Windows Phone Nokia Lumia 900, Samsung Galaxy Note™, and Pantech Element™ tablet. “We’ve seen positive response from customers on our 4G LTE launch, and as today’s expansion shows, we’re continuing our rollout of fast LTE speeds to more areas of Staten Island,” said Tom DeVito, Vice President General Manager for New York and New Jersey. AT&T customers have access to the nation’s largest 4G network, covering nearly 250 million people. Even as 4G LTE expands, AT&T customers are able to enjoy widespread, ultra-fast and consistent 4G speeds on their compatible device as they move in and out of LTE areas. AT&T has two 4G networks that work together for customers, LTE and HSPA+ with enhanced backhaul. With other carriers, when you travel outside of their LTE coverage area, you’re on a much slower 3G network. “We continue to see demand for mobile Internet skyrocket, and our 4G LTE network in St. Louis responds to what customers want from their mobile experience – more, faster, on the best devices,” said Nancy Garvey, AT&T’s vice president/general manager for the Greater Midwest Region. Limited 4G LTE availability in select markets. Deployment ongoing. 4G LTE device and data plan required. Up to 10x claim compares 4G LTE download speeds to industry average 3G download speeds. LTE is a trademark of ETSI. 4G speeds not available everywhere. Learn more about 4G LTE at att.com/network. It seems like the rest of the world is enjoying some HTC One Series love, but those of us in the U.S are still waiting. We got a glimpse of the EVO 4G LTE variant last week, but we won’t see that till probably late May. There is the One X for AT&T, but still nothing official as far as when. Looks like T-Mobile might be the winning carrier for releasing something from the One series first. The One S has been rumored to land on April 22, but according to Tmonews, training has begun and things seem to point towards April 25 instead. Can you handle three more days? I know I can.